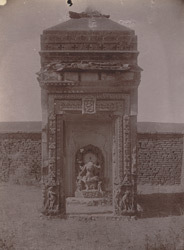 Photograph of a small temple of the Chandella period on a hillock near the Jarah ki Math, near Barwa Sagar, taken by an unknown photographer in c.1890s. The temple is the smallest in the town of Barua Sagar. The North-Western provinces list of 1891 states that, "On the north-east of the embankment there is a small hillock with a ruined temple of the Chandella period." Barua Sagar is also home to the larger Jarah-Ki-Math and Ghugua Math temples. Like the temple shown in this photograph, these two structures were built in the Chandella period and all three bear stylistic affinities to one another. These similarities can be most obviously observed in the design of the shikara or tower and in the ornamentation on the door jambs.